Golfers and surfers are a lot alike. Both are passionate about their favored activity and have little patience for those who don’t take it as seriously as themselves. I’m sure I have angered many a golfer who found themselves near me as I hack away at that little ball, and to make matters worse, I chuckle rather than curse, when said ball makes a 90 degree right turn mid-air. Maybe I watch too many movies. 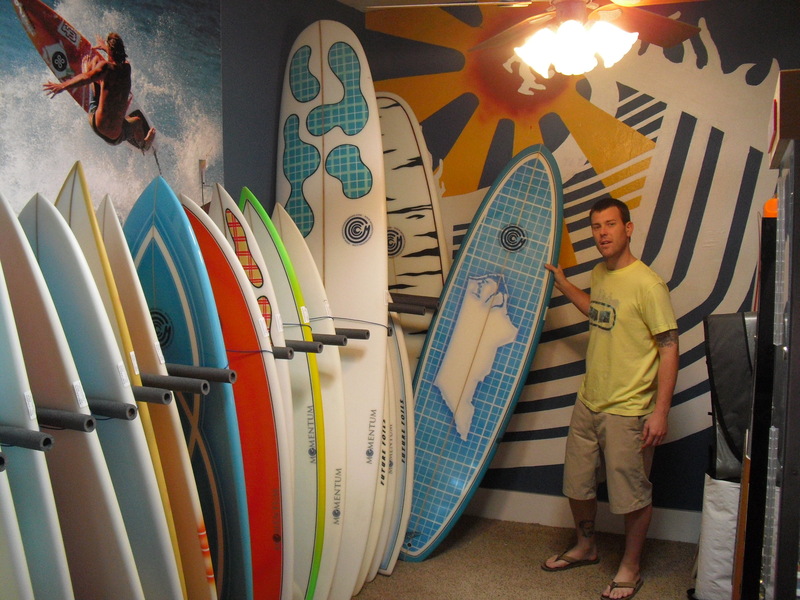 Either that or Hunter Ford, the owner of Momentum Surf & Skate in Wilmington, NC, is just plain cooler than the rest. 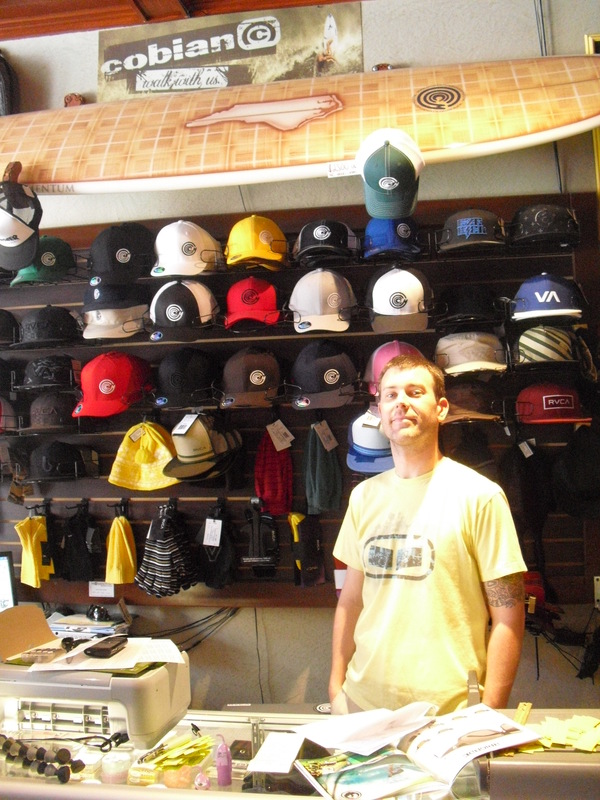 Hunter Ford, owner of Momentum Surf & Skate. 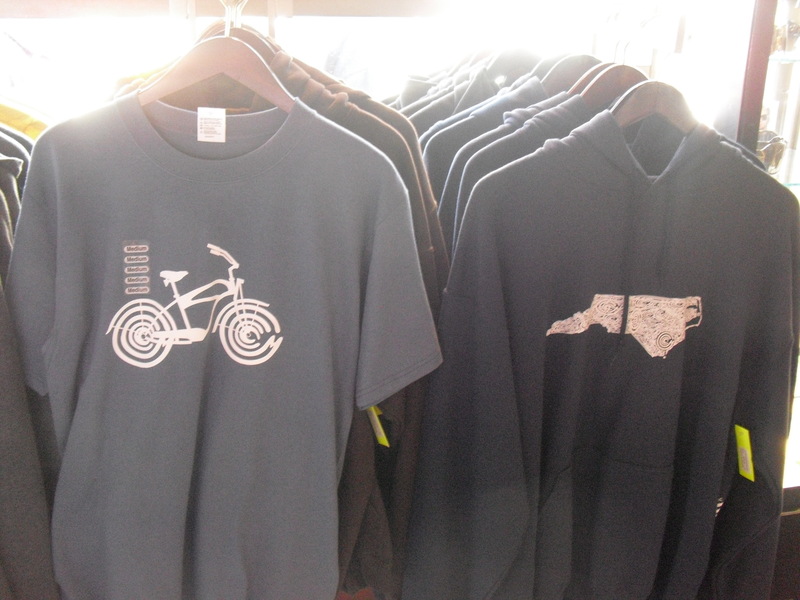 As I was browsing around Momentum Surf & Skate shop in downtown Wilmington, the guy behind the counter said, “Have you seen our new sweatshirts?” He then displayed a shirt with the state of North Carolina front and center, with the store’s logo over the spot where Wilmington would be on the map. I told him it was a nice design, he seemed genuinely flattered. The shop's logo was inspired by the marks left when Hunter burned his hand on his car's lighter. Turns out the guy behind the counter was Hunter Ford, the owner/operator of the shop. Hunter showing off his work and his home state pride. Hunter just laughed after I asked him if he had just broken some surfer code by telling a non-local where the best surfing was. Tell ’em Brohammas sent you and maybe he will give you a deal on a pair of Toms. More likely he will have no idea who I am, but still treat you like a friend. Those surfers from NC are just more cool than those from Hawaii or Cali. Back when I was at BYU-HC, I would hang out with two dudes named Evans and Jeff (Both from NC). Both would travel the world for the best surf and find a reason to live there for the season. These guys were good surfers AND cool as (expletive)! As a Floridian I am obviously biased, but I know surfing, and my low SAT scores and low High School attendance rates along with my poor grammar prove it. I can’t dispute Hunters knowledge of surfing, but will give my opinion on the east coasts best surf spot. And yes, of course… it’s in Florida. At Cocoa Beach the Sebastian Inlet-North Side of the Jetty… 1st Peak! Anyone whos been there knows what I’m talking about…anyone else who surfs should go visit. Would you please send me an email with the address that i am supposed to send my glasses back to. I still havnt had the time to find something else i would like to order so i will let you know thank you so much.